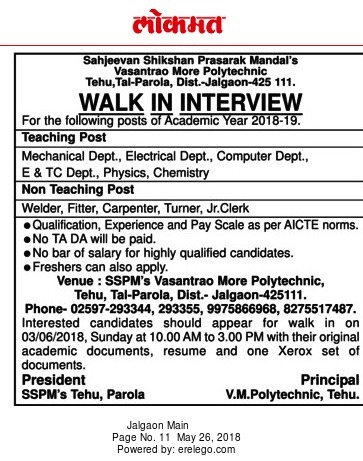 Vasantrao More Polytechnic, Tehu has advertised in THE Lokmat newspaper for recruitment of Teaching, Non Teaching Faculty jobs vacancies. 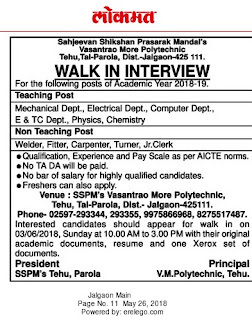 Interested and eligible job aspirants are requested to walk in 03.06.2018. Check out further more details below. Name of the College: Vasantrao More Polytechnic, Tehu. About College: Introducing an institution like Sahjeevan Shikshan Prasarak Mandal insinuates recapitulating a history of 20 years of excellence, a history that is as chequered as the history of modern India. Vasantrao More, being the pioneer education institution in India, has definitely contributed in making India a truly modern and progressive nation by producing a myriad of exceptionally bright alumni who, by their outstanding contributions in the respective fields, not only helped the nation turn into a great state but also afforded their alma mater a reason to seek pride. How to Apply: Candidates can also should appear for walk in on 03/06/2018,Sunday 10a.m to 3p.m with their originals, resume, one Xerox set of documents.